Starting informally in 2012, The Restart Project was established formally in March 2013. This report reflects our first three years of operations and our impact, all of which we have achieved without large-scale institutional support. 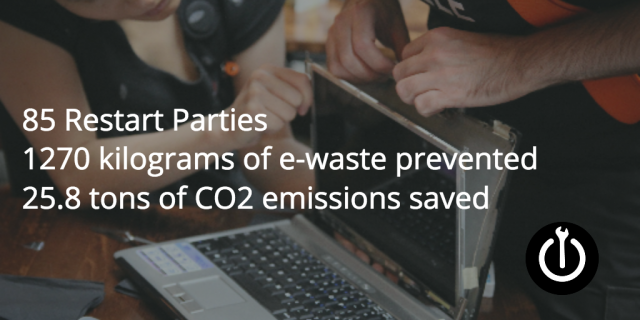 Since June 2012, focusing on the communities near Camden and Brixton, at our 85 community electronics repair events – called Restart Parties – we have prevented 1270 kilograms of electronic waste, thereby preventing 25.8 metric tons of carbon emissions. Our volunteers – called Restarters – have contributed 567 people hours in these two communities since April 2014, sharing their skills with 1379 people and helping them become more environmentally conscious and rethink their relationship with electronics. 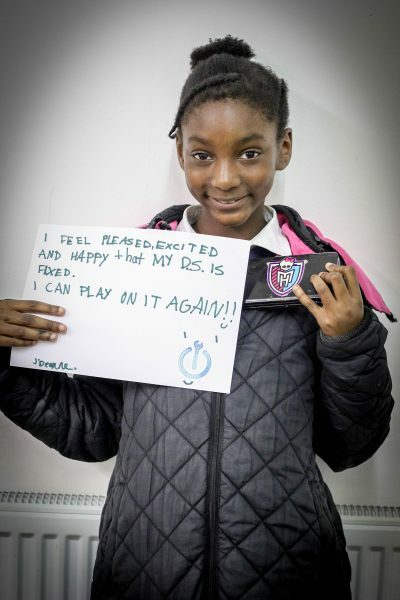 In special events beyond our focus communities, a further 494 people have learned repair skills from our Restarters. The Restart Project has provided an income generation opportunity for 10 of our most talented repairers, who teach repair in our paid events. Participants and supporters say that our “Restart Parties” and related communications cause them to make the link between using their electronics longer and reducing their individual environmental impact. This is evidenced by the number of self-repairs inspired by us, shared online. We’ve spoken in public about the need for a more sustainable relationship with electronics, 37 times since 2012: including at TEDxBrixton, London Design Week, the V&A, Nesta, Makerfaire Rome and guest lectures at the University of the Arts London. Our work engaging media allowed us to expand the reach of our message even further, with a live appearance on The One Show reaching roughly 5 million viewers, a BBC Click piece on television and the BBC website on DIY tablet repair reaching over 2 million people, and a major feature in The Sunday Telegraph magazine reaching a readership of 1 million. In 2015, we began to produce our own podcast. We’ve encouraged and helped 37 people around the world to host their own Restart Parties, in 6 countries from Canada to Tunisia. Other groups have now hosted more Restart Parties than we have. We continue to support Restart Party hosts, with serious expressions of interest from Singapore, Spain, Greece and Portugal. Our work with businesses and local authorities has grown dramatically, with a residency in iconic retailer Selfridges and work with the City of London and Westminster, and a pilot project with Havering Council. These collaborations help us influence different audiences and groups. 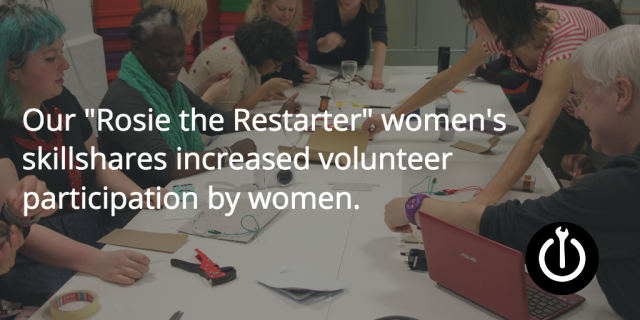 We recognise the need to improve the gender balance in our volunteer pool, so we began to host “Rosie the Restarter” women’s skillshares in 2014. This work has paid off, with a 10% increase in the number of women volunteers, but must be sustained to have a longer-term impact. Our work only occasionally reaches children, and we have identified the need to work with teachers and schools. We are developing a tool to track and reveal our aggregate global environmental impact, and we are confident this will serve as a motivator to others, helping spread the reach of the Restart Party even further. This project is made possible by WRAP’s Innovation in Waste Prevention fund.